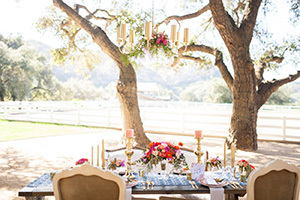 Giracci Vineyards & Farms is Orange County’s premiere outdoor wedding venue. Set on a 10-acre parcel in Silverado Canyon, the property boasts vineyards, 150-year-old oak trees, a historic fountain, beautiful gardens and a magnificent gazebo. Some outstanding features in our beautifully appointed octagonal shaped tasting room include the handcrafted mahogany bar, 7′ wrought iron chandelier, the beautiful slate floor and original river rock fire place. The tasting room provides the perfect setting for pictures, the cake table, hors d’ oeuvres or for the bride and her attendants to relax before the ceremony. Whether you are walking up an aisle of lavender and rose petals, taking photos with a beautiful vineyard backdrop or dancing under the twinkle lights of the majestic 150-year-old oak trees, Giracci Vineyards & Farms is the perfect setting for your fairytale wedding. We strive to make your day Magnificent, Magical and Memorable! Located just minutes from Executive Parks in Irvine, Lake Forest, Newport Beach and Anaheim, Giracci Vineyards & Farms is the perfect location for your corporate occasion. We can accommodate meetings, luncheons, dinners and team building events. We can provide interactive, educational wine tasting parties, cooking classes, catered dinners as well as themed events. Our customers include Deloitte & Touche, OC Wine Society, Laura’s House, Legal Aid Society of Los Angeles, the Inter Canyon League (ICL) and many more. If you are looking for something new and exciting close to home, then Giracci Vineyards & Farms is the place for your special event. From birthday parties to baptisms, bat mitzvahs and sweet 16’s, Giracci Vineyards & Farms is the premiere location for any event. No matter what the occasion, Giracci Vineyards & Farms can make it happen. There is no theme we can’t make a reality, no culinary genre we can’t create…so browse through our gallery for some great ideas to see what Giracci Vineyards & Farms has to offer! With the help of our fabulous caterers and event planners, there is no event you can dream of that Giracci cannot make a reality! 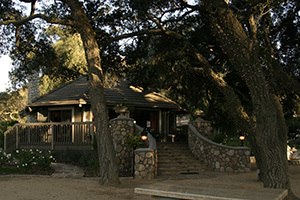 Welcome to Giracci Vineyards & Farms, one of Orange County’s premiere event venues. We have three beautiful locations on the property, Oak Tree Court & Tasting Room, Wishing Well Court & Gazebo and the Stone Cottage & BBQ. You may reserve one or all three locations for your event. To inquire about pricing please contact Michele at magopian[at]giracci[dot]com. Giracci Vineyards and Farms provides a list of preferred caterers, photographers and other vendors who are familiar with the property and can provide the smoothest, highest-quality service for your event. Visit our website to see our list of preferred vendors. Giracci Vineyards and Farms will provide an event liaison to answer your questions, direct the caterer and other vendors and to ensure that your event runs smooth and seamless. Giracci Vineyards and Farms does have a list of Preferred Vendors, some must be used from our list. Our award winning wines will be served in the Tasting Room, Wishing Well Court or at the Barrel Bar during your event. We can also provide bottled beer or kegs as well as champagne. We charge a $10 corkage fee per bottle for any non-Giracci wines served on the premises. We have all-inclusive packages (corporate events ONLY) that start at $100.00pp/100 guest count which include the site, tables, chairs and basic linens for up to 100 guests and a basic catering menu. We require a $2500 security deposit as well as a 50% deposit (or $5000, whichever is greater) to secure your date and start the process. We can then start pricing your package depending on the caterer and other items that you choose. The balance will be due 30 days before the event. An 18% service charge will be added to the site fee. Currently we hold only two events a month, so space is limited. Tours are provided Mondays and Thursdays and prior to tasting room hours Friday, Saturday and Sunday. For a personal quote, to make an appointment for a tour or for more information, please call 714-602-1109 Ext 502, or e-mail us at info [at] giracci [dot] com. Situated outside the Tasting Room, nestled under romantic oak trees, Oak Tree Court is the most romantic evening area to be found anywhere. The Giracci grounds are surrounded by jasmine, rose and lavender gardens. During the daytime beautiful horses and expert equestrians can be viewed in the Hunter/Jumper arena. 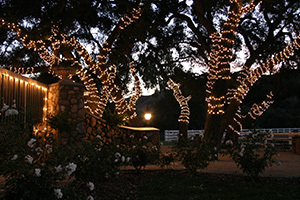 Evening provides a romantic, magical atmosphere of twinkle lit trees and cool breezes. Oak Tree Court path’s lead down to the main stairway on the property, where the original fountain from the Ambassador Hotel can be found. Seating for 100-200 guests can be accommodated in this area. It is best for larger events, and those that will be going into the night. Pricing available upon request. Unlike many wineries, Giracci loves to promote all the wineries that Orange County and other Central and Southern California areas have to offer to wine lovers. Each year, Giracci does the following wine tours, planned down to the last detail by our experienced event planners. In 2011, we’ll be embarking on our 3rd annual wine tour of Orange County. In years past we have visited well-known wineries in Orange County. At the same time, we always find a few hidden gems throughout the county. While tasting some of the best wines Orange County has to offer, we taste some fabulous food: from Giracci’s famous carrot cake to their Everything-In-The-Garden Salad and from their gourmet Italian fare to exotic cheese plates and a fabulous foodie dinner at Giracci, catered by the best Orange County has to offer (with a different culinary theme each year). With fantastic wine, gourmet food, friends and fun, our Orange County wine tour is by far the best way to spend a Saturday right here at home! Information and tickets for this event will be posted in late spring, so please visit our site again soon! In past years, we have done tours of Paso Robles, Sonoma, Santa Ynez and many more. This year, we have decided to tour a wine center a little closer to home: Temecula wine country. We’ll be visiting some of the most popular vineyards in the area, along with some lesser known but no less fabulous vineyards along the way. With gourmet food, great wine, good friends and a lot of fun, along with some fancy transportation to make the trip even more amazing, we promise you’ll have a great time. The trip will take place in late October during crush. The plans, including the date and times of the trip, pricing, and the wineries we’ll be visiting will be posted mid-August, so make sure to check back again soon for more information. Wine Club members get a discount on tickets, so check out our Winner’s Circle Wine Club and find out all the perks, and wines, you can receive by joining, and the best part is‚ the membership is FREE!! !